The sacred thread is a thread that is worn by Brahmins as well as Kshatriyas and Vaishyas after it is bestowed upon them amidst chanting of the Vedic hymns by pundits at a ceremony called the Upanayanam ceremony. It is made of three lines of pure cotton thread strands tied together with a single knot to form one sacred thread amidst the chanting of the Vedic mantras glorifying it. Thereafter, the person is required to perform the worship of Sun and Gayatri by performing a ritual known as Sandhyavandanam (three times a day), daily without fail, which I have discussed in two previous articles already. The knot signifies the Brahma Granthi which should be passed by the soul or mind to attain self-realization or knowledge. It can also be interpreted as a stage where one is held up in doubts and in a very difficult situation unable to solve it. Brahma Granthi is the first knot or obstruction in our spinal chord located at the base which prevents us from gaining knowledge. It tends to make you self-protective and afraid of accomplishing new tasks. Once you cross that barrier, you can attain knowledge. Yajjnopavita is to be spelled as "YajnOpaveetam" the letter 't' spelled as in the word "with". It signifies as a qualification sanctioned to the person certifying his ability or capability to acquire self-realization and to perform the Sandhyavandanam reciting the Gayatri mantra. A Brahmin boy possesses this ability at the age of 8 whereas the Kshatriya gets it at the age of 11 and a Vaishya at the age of 12 years as per norms set by Vedas. But, they need to wear this thread offered to them through the ritual of Upanayanam ceremony on reaching this age or after that age. 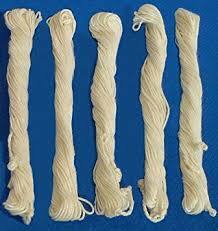 You might be wondering what do the three strands of the sacred thread represent. The three strands of the sacred thread or Janevu refer to the three primary duties and responsibilities of a person in his life. His duty towards his teachers who lead him towards enlightenment. His responsibility towards his parents and ancestors who gave birth to him and took utmost care of him and handed over their invaluable culture and traditions to him. His duty towards the great Sages and Rishis who got enlightened through severe penance and devoted their lives to spreading their knowledge and services for the upliftment of the innocent people. It becomes the duty of a person to carry forward this incomplete mission of those great souls. The three strands further signify the existence of three Nadis or passages of energy in our body. They are named as Ida, Pingala, and Shusumna in the Vedas. They are said to be existing in our spinal cord. They carry the vital powers of the energy of our life. Ida Nadi and Pingala Nadi are referred to as Shiva and Shakti or Purusha and Prakriti without which there can be no life. Sushumna Nadi represents a stage of enlightenment which is above all physical attachments. So, the sacred thread or Yajgyopavitam signifies the reality and essential structure of the growth of knowledge in human life. There are some variations and stages of wearing the Yajgyopavitam as set by the Vedas. A bachelor boy can wear only one thread that consists of a knot and three strands. A married person is to wear two threads of the Yajgyopavitam that is made by combining two sets of threads. (Total six strands). A person, after possessing children, reaching the age of old age is endowed with three threads that are made with three individual sets of Yajgyopavitam. Thus he wears a total of nine strands.